High performance 2.5mm. Copper heats much faster, cools much faster than any other metal and offers superior cooking control. 100% Copper body-bonded to a thin layer of stainless steel. Copper offers superior heat conductivity; stainless steel interior is hard wearing, non-reactive, ideal for all types of cooking activities. HANDLES STAY COOL. Cast stainless steel handles stay cool. M’Heritage 250C2 handles are substantial for added balance. They have an iron electroplated finish which makes them beautiful and functional. Mauviel, a French family business established in 1830 and located in the Normandy town of Villedieu-les-Poeles, is the foremost manufacturer of professional copper cookware in the world today. Highly regarded in the professional world, with over 170-Year of experience, Mauviel offers several different lines of copper cookware to professional chefs and home cooks that appreciate the benefits of their high-quality products. Professional cooks can attest that copper cookware is an essential part of every cookware collection as it is 2X more conductive than aluminum and 10X more conductive than stainless steel. 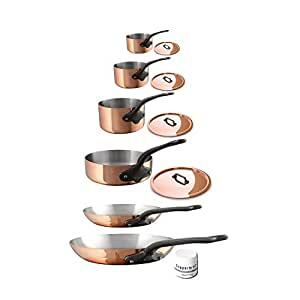 This advantage makes copper the very best material for cooking, as it is unsurpassed in its ability to heat up evenly and rapidly and to cool down quickly, allowing for maximum control and great cooking results. Mauviel M’Heritage M250C Copper cookware combines two efficient materials that are perfect for cooking and table presentation. The 100% Copper body is 2.5mm thick and is bonded to a very thin stainless interior. Copper offers superior heat conductivity. Stainless Steel interior is hard wearing, non-reactive and ideal for all types of cooking activities, it is easy to clean and very durable. M250C is safe to use in the oven and on top of the stove with gas, electric or halogen heating elements. the Mauviel M’Heritage M250C Collection has straight sides and substantial, stay cool cast stainless steel handles that have an iron electroplated finish. The handles are firmly riveted to the body with stainless steel rivets. The handles are traditional, and offer excellent balance. Made in France. All Mauviel products are guaranteed for life against any manufacturing defects for household use.